Originally published on Torontoist on September 4, 2012. Like a viral epidemic, frozen-yogurt chains and franchises-in-the-making are spreading across the city. Every few seconds, a new froyo parlour opens or papers an empty storefront with its logo. The craze has filled in spaces closed for years, like the former Demetra’s restaurant on Danforth Avenue, where place settings appeared untouched for at least a decade. A quarter of a century ago, the first wave of frozen-yogurt purveyors spread across the city. Perceived as a healthier alternative to ice cream due to its lower fat content and presence of bacterial cultures, frozen yogurt began popping up in malls. Chains like TCBY and Yogen Früz dotted the landscape, and among the companies attempting to cash in was Silcorp, owner of Mac’s convenience stores. Apart from today’s ad and patent information, we uncovered little information regarding their Puffins Yogurt Emporium concept. Perhaps it was folded into another chain Silcorp launched in 1987: Yogurty’s Yogurt Discovery. According to a Calgary Herald article, Yogurty’s original target market was the “18-to-45-year-old yuppie with a female skew.” The piece noted that “the public, men in particular, still needs to be educated to the virtues of 30 flavours of frozen yogurt, garnished with one of 40 toppings.” It was hoped that the chain’s mascot, “a young, moustachioed explorer, with a bird on his shoulder, searching the world for new yogurt flavours,” would help break consumer resistance to the product. Run for a time alongside Silcorp’s Baskin-Robbins franchise, Yogurty’s wound up in the hands of Yogen Früz in the early 1990s and lingered until it was revamped as a self-serve chain. The intrepid explorer was given his walking papers long ago, his educator role filled by tiny paper sample cups. As for Puffins, its Yonge and Eglinton location has seen a succession of eateries over the years, including current tenant Gourmet Burger Co.
Additional material from the June 28, 1989 edition of the Calgary Herald. Self-serve fro-yo quickly ran its course in the former Demetra’s site, which is a credit union as of 2018. 2419 Yonge has also changed — its current occupant is a supplements store. Originally published on Torontoist on August 28, 2012. Toronto Star, August 16, 1962 (left); Globe and Mail, August 21, 1962 (right). When Phyllis Diller, who died last week at the age of 95, began her career in the late 1950s, female stand-up comics were a rarity. Figuring out how to book them could be a challenge, which led to some odd bills. Take one of Diller’s earliest appearances in Toronto, where she shared the spotlight for two weeks in August 1962 with an ice revue presented by Broadway producer Alexander H. Cohen. The mix didn’t work for Globe and Mail reviewer John Kraglund, who was unimpressed by the first hour-and-a-half of the evening. He didn’t feel any sparks until Joe Jackson Jr., “a ragged tramp of a clown with an almost guileless smile and a bicycle” performed a quiet but funny routine about his disintegrating bike. A few minutes later Phyllis Diller slithered sexily on to the stage, then became herself and proceeded to convulse the audience with skillfully timed, loud, earthy humour. At 10:45 p.m., I left the theatre, firmly convinced there is nothing like a couple of topnotch professionals to pep up an amateurish production. It was back at her early days at San Francisco’s Purple Onion that I first met Miss Diller. In those intimate quarters she was funny, for one could not ignore her wickedly lusty laugh, broad gestures and constantly changing facial contortions. She is one of those rare performers who can project most of this through the vast expanse of the O’Keefe Centre. Even with these reservations, Miss Diller was rather like a breath of fresh air after a rather lengthy period in the doldrums, which had only been relieved by Mr. Jackson. Additional material from the August 21, 1962 edition of the Globe and Mail. Good time: Comedienne Phyllis Diller checks out budget-priced watches at a Kensington Avenue stall. She’s a self-confessed shopaholic. Photo by Bernard Weil, 1991. Toronto Public Library from the Toronto Star Archives, tspa_0043919f. When updating this piece, I dove into the Toronto Public Library’s Toronto Star photo archive to see if there were any contemporary pictures of Diller. There weren’t (the oldest were from 1972), but this image stood out, showing the comedian having what might appear to be an ordinary day for anyone wandering Kensington Market. 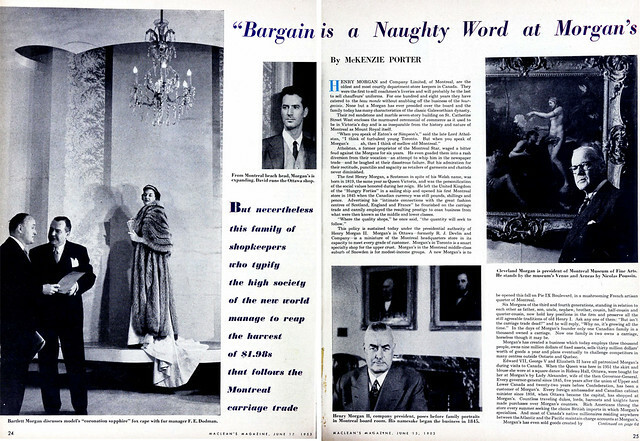 According to a November 28, 1991 Star article, besides browsing watches, Diller stopped at Courage My Love (“this is my kind of place,” she said as she bought a lilac velvet lounging jacket and a black cotton top hat), a sock stall, and Tom’s Place. Originally published on Torontoist on August 21, 2012. Globe and Mail, August 17, 1962. An official opening presided over by Quebec Premier Jean Lesage. The unveiling of the $3 million Better Living Centre, touted as a showcase for “refinement in contemporary living.” Four nights of free concerts by Louis Armstrong at the Bandshell. Yes, the 1962 edition of the CNE had plenty to offer for adults. But who did the kids want to see? Larry, Moe, and Curly Joe. Riding a renewed wave of popularity thanks to reruns of their classic shorts on television and a new series of kid-friendly features in theatres, the Three Stooges were natural headliners for the CNE Grandstand’s “Matinee Fun-Fest.” Their opening performance on October 20, 1962, drew 20,000 children to see the veteran comics as part of a bill that also included clowns with green-foil eyelashes and acrobats who dangled from the Star’s helicopter. Additional material from the August 17, 1962 and August 21, 1962 editions of the Globe and Mail, and the August 21, 1962 edition of the Toronto Star. Originally published (with plenty of photos) on Torontoist on August 20, 2012. When zombies are around, trouble looms. Whether caused by disease, viral outbreaks, space debris, or science gone bad, a gathering of the undead tends not to turn out well for the living. And yet even though logic dictates that one should run when faced with a mass of shambling, shuffling creatures, curiosity draws us to them despite the mortal danger. I’m guilty of this. How else can I explain why I ventured into the middle of a gathering of zombies who appeared to be…washing cars? I had heard rumours that the undead were being used to clean the vehicles of the living. The washes are reputed to serve as a fundraising effort for the annual zombie walk through the streets of Toronto. Further rumours suggested that the Heart and Stroke Foundation is a partner in this year’s walk. As I pulled into the Classic Coin Car Wash at College Street and Lansdowne Avenue, my heart jumped a little. Was I putting my life on the line to discover if a zombie could wash my vehicle? Perhaps, but I had to find out if the undead could do a better job than some of the mechanized car washes around town, whose programmed cleaning cycles can miss a spot or two. Judging from her fresh-looking gaping wounds and relatively peachy colour, it appeared the zombie collecting my money had recently joined the undead. Her partner was grey and slower-moving, which made it easy to close the window on him when he attempted to eat my brains. I was motioned to park the car and wait for a bay to open up. Since the air lacked agonized screaming, I figured the situation was under enough control that it was safe to wander the lot. There was a table where several zombies had been pressed into bake sale/T-shirt-selling duty. Even the undead have embraced the cupcake craze: frosting swirled like a brain was a good match with the chocolate cake, even if I tried not to ponder what (or who) might have gone into the sweet topping. As I drove my car into an open bay, it was swarmed by a legion of groaning zombies. Their eyes spoke of their inner longing to have me for lunch as they slowly spread blood across my vehicle. Their slow, jerky motions shook the car a bit, which was unnerving until I realized they were spreading their bloody mess onto every spot of dirt. Still, the thought that they might turn on me at any second made me want to flee the car the second the horde shuffled off to work on another car. Back in the lot, more zombies had ventured to the curb to draw in traffic. Their efforts appeared to be working, as a line snaked westward along College Street. While some undead mumbled about brains, others offered children cotton candy. One brave kid smiled when a zombie grunted that he could leave a bloody print on the child’s t-shirt (with parental approval, of course). Any lingering worries about a sudden attack evaporated. Soon it was time to drive off. I looked over the car and determined that training the undead to clean vehicles might have been a good idea. The car smelled fresh and soapy. The blood had been washed off. With the zombies’ attentions turned to other drivers who shared my morbid sense of curiosity, I drove out of the lot. Just to be to safe, I checked the trunk a few miles down the road just to make sure nothing had crawled in while I wasn’t looking. This was a fun story to write — what’s there not to enjoy when scribbling about zombies washing your car? It didn’t hurt the participants totally threw themselves into character while cleaning my vehicle, and left it looking spiffy. It’s possible I may have taken backup photos, but currently I cannot find most of the images I snapped during 2012. When/if I do, this post will be updated. Otherwise, check the link at the beginning of this piece. Originally published on Torontoist on August 14, 2012. The Telegram, November 6, 1970. You won’t find a cigarette machine or a pay phone in a McDonald’s drive-in restaurant, because they don’t want you to stop there for purposes other than eating. The store manager orders your food put on the grill when your front wheels touch the parking lot, not when you place your order. He decided what you will be eating on the basis of projections from previous periods. The cooked hamburgers, cheeseburgers and fish sandwiches are put in heated holding bins. If you and your fellow customers in the restaurant vary your orders from past averages enough that a hamburger is in a bin longer than 10 minutes, it is thrown out. With ever-growing sales spurred by a price drop and rapid expansion, what difference did a few tossed-out burgers make? Store managers proudly donned their paper hats in ads like this one, to announce that, as a result of lower supply costs, prices were dropping on most menu items by up to 10 cents. McDonald’s Canadian operation—which launched in Richmond, British Columbia in 1967 and debuted in Toronto a year later at 3777 Keele Street (now a KFC/Taco Bell combo)—was initially forced to import nearly all of its food and supplies, because Canadian companies weren’t convinced that the chain would ever meet its projected sales volumes. By 1970, McDonald’s had found local suppliers willing to meet its financial terms. It dropped Canadian menu prices to match those at locations south of the border. The new prices worked. In the 10 Canadian stores that were open as of January 1970, sales were 52 per cent higher a year later. Those numbers widened the smile on Ronald McDonald’s painted face. Additional material from the February 10, 1971 edition of the Globe and Mail. Originally published on Torontoist on August 10, 2012. Last night, a fleet of white buses carried white-clad passengers from pickup points around downtown for the first official Toronto edition of Dîner en Blanc. Described on its website as “an evening full of elegance and surprises,” Dîner en Blanc is a “secret” dinner party where registered participants dress entirely in white and are taken to a location that isn’t announced in advance—usually a large public space like a park or historical site. Diners bring their own food and seating. The event is intended to create a refined communal experience. It originated in Paris in 1988, and instances of it have since been held in cities around the world. The only missing white element at Fort York was a flag of surrender, as attendees took the summer showers in stride. (Most umbrellas matched the colour scheme.) Rain or shine, the dinner would proceed. While some diners donned clear plastic ponchos distributed by event volunteers, others soaked up the showers while erecting tables they had stowed in the buses. Participants were responsible for decorating their own dining areas, resulting in a mix of white tablecloths, floral centrepieces and tealights. Their picnic baskets were loaded with everything from traditional picnic fare to three-course gourmet meals, all washed down with liberal amounts of wine. Wong was involved in last year’s dry run of Dîner en Blanc at the Distillery, which drew 400 people. While that test skirted some of the event’s traditions (tables, chairs, and catered food were provided), this year’s was “totally by the book.” Planning began in January and eventually involved a team of 50 volunteers. There were about 1,400 registered guests. The coordination effort included preserving the mystery of where the event would be held until the last minute. Though locations like Nathan Phillips Square were considered, the organizers chose Fort York because of its ample space, its greenery, and its historical value. The site fits what Wong described as the event’s “whole joie de vive.” Beyond the War of 1812–bicentennial aspects of Fort York, the site’s role as the birthplace of Toronto symbolically matched the first official edition of what organizers intend to be an annual event. The setting also provided an interesting visual contrast between the genteel diners seated in rows of white tables and the concrete skeletons of skyscrapers and clogged westbound Gardiner Expressway in the background. Anyone who attended will receive an invitation for next year’s dinner, along with the opportunity to invite guests. Wong suspects there will be spaces for at least 2,000 people next year, some of whom might be among the 3,200 who were on the waiting list this time around. Steady growth has been a component of the event, with 15,000 now attending the Paris edition. As the night went on, the rain eased and the umbrellas became decoration. Meals were accompanied by live jazz and operatic singing from a central stage. Friends toasted each other. A round of “Happy Birthday” was heard. Cameras were everywhere, including at an official photo booth. Underneath all the white trappings, it was an opportunity for friends and family to enjoy good food and company, out in the open. Things that weren’t in the website’s budget: clothing to attend this event. Turned out press also had to wear white, which left me scrambling to find something, which was odd considering I owned next-to-no white clothing in my wardrobe. You won’t find any solid white shirts hanging in my closet – I think the colour always represented a strain of conformity and staidness. Originally published on Torontoist on March 23, 2007. Source: Leaside High School Clan Call, 1959/60 edition. Quick–name the first department store chain to locate in suburban Toronto. Eaton’s? No, they waited until 1961 to open shop in Don Mills. Simpson’s? No, they followed Eaton’s a year later, landing in Scarborough at Cedarbrae Plaza. Try a chain that only lasted in Toronto for a decade, but whose locations served those moving into areas like North York and Etobicoke. Morgan’s roots were in Montreal, where Henry Morgan opened a dry goods store in 1845 (originally Smith & Morgan, until Smith sold out a few years later). In 1891, the store moved to St. Catherine Street, the first of several department stores to locate in what soon became Montreal’s retail centre. Morgan’s entered Toronto in 1950, with the Bloor Street store mentioned in this ad. 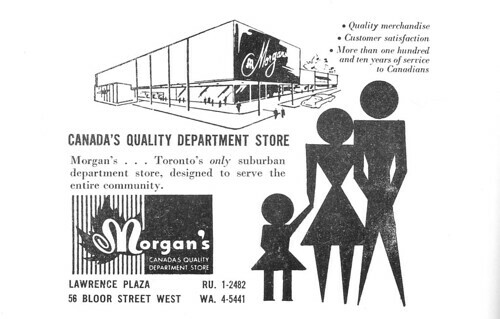 As they claim in this ad, Morgan’s was the first department to move into Toronto’s suburbs, with stores at Lawrence Plaza in North York (1955) and Cloverdale Mall in Etobicoke (1960). Morgan’s presence in Toronto was short-lived, as the company was sold to the Hudson’s Bay Company towards the end of 1960, which would HBC’s first venture into department stores in eastern Canada. While the Ontario locations saw a name change within a few years, the Morgan’s name hung on in Quebec until 1972 (HBC would repeat this tactic years later, when the Simpson’s nameplate was reduced to Toronto). The flagship store on St. Catherine still operates. As for the Toronto locations, the Bloor Street address is buried within Holt Renfrew, Lawrence Plaza is split between Winners and Dominion and Cloverdale is now home to Zellers. Originally published on Torontoist on August 8, 2012. Don Mills Mirror, November 13, 1963. A menu full of cozy comfort foods for harried shoppers, kids tagging along, and managers from nearby industrial plants along Scarborough’s Golden Mile. That, at any rate, is who we imagine today’s ad—for the restaurant inside a Morgan’s department store—was targeting. While some of these old Toronto favourites linger on in diners and cafeterias, milk and crackers is nowhere to be found on menus at modern eateries, just as “smorgasbord” has given way to “buffet.” There are times when we wonder if bylaws existed in every municipality within Metro Toronto that obliged all dining establishments to serve roast beef with Yorkshire pudding and a salad plate incorporating cottage cheese. Toronto Star, August 22, 1963. Opened on August 22, 1963, the Eglinton Square Morgan’s was the fourth Metro Toronto location since the chain entered the market in 1950, and the first since Hudson’s Bay Company took over the business in 1960. The event was marked by the arrival of store manager D.B. Murdy in a helicopter, which was promptly offered for sale after he disembarked. Besides choppers, the store also allowed customers to order “anything else possible and legal.” The Hearth was a second floor cafeteria that seated 150 and, according to the Star, was decorated with “six murals of early Toronto plus antiques such as flintlock rifles, copper kettles and spinning wheels.” For the convenience of drivers, a spiral parkade adjoined the store. The store’s days as Morgan’s were short-lived. The following year, management dropped the brand outside of Quebec and renamed the stores The Bay. Additional material from the August 21, 1963 edition of the Toronto Star. Maclean’s, June 15, 1953. Click on image for larger version. Morgan’s abhors the word “bargain.” Nothing is ever “cheap” at Morgan’s. The advertising copy writers on Morgan’s staff are niggardly with the word “sale.” But every month Morgan’s offers a prize of two dollars to any member of the staff who sports in a rival store a comparable article selling at a lower price. Last March there were only three winners. The budget floor in Morgan’s is not in the basement because that would give it an unfortunae association with “bargain.” It is on the third floor, and the third-floor staff is watched with particular care to see that its customers are treated with the same deference observed in the more ritzy departments. On the budget floor models slink around in twenty-four dollar dresses with the same femme fatale fluidity they assume in the more expensive salon downstairs. Last April when Eve Trill, the fashion director, was posing models for catalogue photographs of cotton house dresses at five-ninety she made them wear dainty gloves and cute hats to show that the garments were suitable for outdoor wear too. Toronto Star, November 7, 1960. As of early 2018, none of the three stores listed in this article remain Bay-owned stores. The Bloor flagship is now Holt Renfrew, while Lawrence Plaza is split between Metro and Winners. Cloverdale, after a stint as a Target, is planned to be redeveloped into more retail, a gym, and a food court. The Toronto Star‘s preview of the Eglinton Square Morgan’s, from its August 21, 1963 edition. Photo by Reg Innell, 1963. Toronto Public Library, from the Toronto Star Archives, tspa_0110310f. A clearer version of the photo used in the previous article. While you can still park on the roof of the main section of the mall (which involves a neat retro experience of driving up the ramps), the parkcade shown here has been torn down. With the Eglinton Crosstown LRT headed in Eglinton Square’s direction, a redevelopment plan has been proposed which would retain the mall and add residential towers. Toronto Star, August 21, 1963.